The Derweze area is rich in natural gas. While drilling in 1971, Soviet geologists tapped into a cavern filled with natural gas. The ground beneath the drilling rig collapsed, leaving a large hole with a diameter of 70 metres (230 ft) at 40°15′10″N 58°26′22″E. To avoid poisonous gas discharge, it was decided the best solution was burn it off. Geologists had hoped the fire would use all the fuel in a matter of days, but the gas is still burning today. Locals have dubbed the cavern "The Door to Hell". Next to capturing the gas, flaring is safer and friendlier to the environment than releasing the methane into the atmosphere, as methane is a relatively potent greenhouse gas and considered to have a high global warming potential of 72 (averaged over 20 years) or 25 (averaged over 100 years). Turkmenistan plans to increase its production of natural gas. 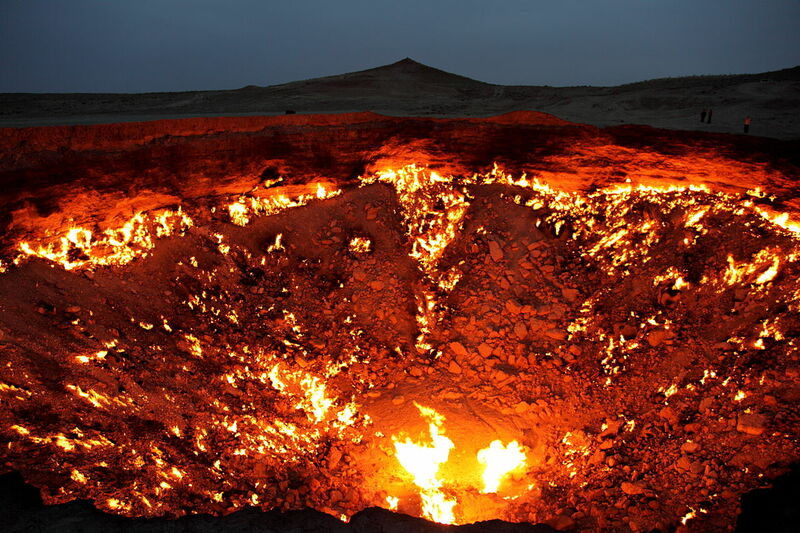 In April 2010, the President of Turkmenistan Gurbanguly Berdimuhamedow visited the site and ordered that the hole should be closed, or measures be taken to limit its influence on the development of other natural gas fields in the area.